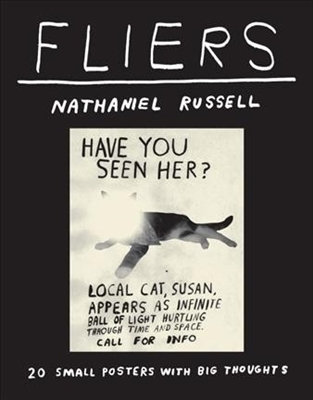 This collection of viral fake fliers is at once strange, thought-provoking, and hilarious. Printed on heavy, cardstock-like paper, these 20 "fake" fliers both celebrate and embody surreal posters. As a bonus feature, the sturdy paperback comes with a french-fold jacket that, when removed, opens up to reveal a larger poster. There is something in this collection for everyone who ever looked at a postered telephone pole or coffee house bulletin board and wondered "is there more out there?"